A water flosser is an electrical unit that shoots jets of water at one’s teeth. It’s best for use if you’re susceptible to gingivitis and in case you’ve bleeding gums. Research has found that water flossers are useful in staving off both of these conditions. Although water flossers aim water at your teeth, some say they don’t get in between the teeth as thoroughly as regular floss. 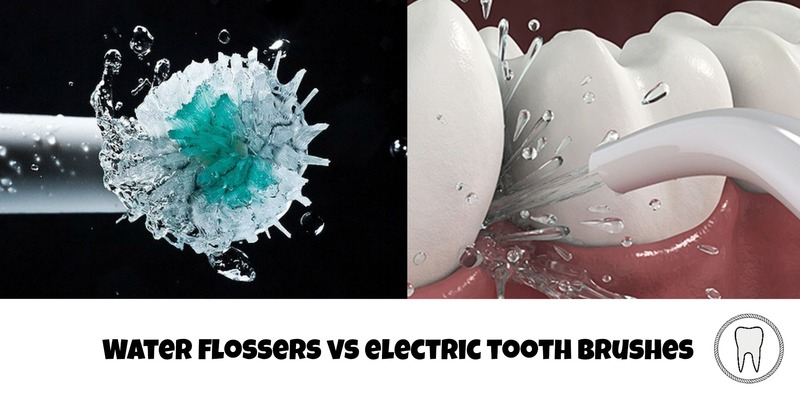 Electric toothbrushes can prove more efficient in enhancing gum health and removing plaque. They are a much better overall teeth cleaning device, and really, there shouldn’t be a substitute. If you’ve any difficulties with handling manual toothbrushes due to medical conditions like Parkinson’s or Arthritis, an electric toothbrush would be much more manageable. Research shows that electric toothbrushes are much more gentle on the gums too. The main advantage to water flossers is that they provide a reliable alternative to those who opt not to floss. The unit shoots out a water stream which you can aim between teeth. It helps remove food particles which could otherwise result in gingivitis or tooth decay if not removed. A water flosser is a convenient option for those who’d otherwise do nothing to clean in between their teeth. For some people, its a fare more appealing option than messing around with traditional dental floss. Of course, any tool that makes a user more enthusiastic about their oral care is an excellent tool to use! Water flossers are much easier to use, especially for those who find it hard to use their hands or don’t have the dexterity required to use floss. Electric toothbrushes, just like water flossers, can seem more appealing to use instead of manual toothbrushes and regular dental floss. They’re also more enticing than other options for a number of reasons. An electric toothbrush is a great time saver and perform a more thorough cleaning job as they provide 6,000-30,000 strokes per minute. It’ll take lesser time to clean one’s teeth properly, and they even run on a timer to ensure you are doing a thorough job. However, that doesn’t imply that quickly running the brush over your teeth will be effective. It’s vitally crucial that you ensure every tooth is thoroughly cleaned. Electric toothbrushes are a great option as they’re comfortable to hold and will take care of the rotating action. Unfortunately, some say that a water flosser won’t do as great of a job cleaning plaque off your teeth as traditional floss would. The water stream which hits the teeth may pass over built up tartar and plaque. Also, it doesn’t have the strength required to clean deeply between your teeth. Water flossers can be relatively expensive, but its generally considered that they’re worth the investment in the long run. Top-quality electric toothbrushes are significantly pricey. It’s even more expensive when we consider the fact that you’ll need to replace the heads as frequently as you would with a regular toothbrush. The bulky nature of an electric toothbrush may not suit those who often travel, as well as those who highly value their counter space in their bathrooms. Having said that, the more time goes on, the slimmer these toothbrushes get. Some people find the vibrations created to be aggravating, and sometimes painful. Those with loose teeth, gum issues, or general sensitivity might want to consider another brushing technique. Controlling the vigor and pressure of an electric toothbrush can be quite challenging for some. Electric toothbrushes would be helpful for individuals who’ve uneven teeth, braces, or other orthodontic devices. Dental experts assert that electric toothbrushes are more motivating for people to make use of, eliminating teeth stains better than manual brushes. Water flossers might not be important for everyone as their primary purpose is to remove food particles which have settled into orthodontic devices like braces. Unless you only intend to remove plaque, purchasing a water flosser isn’t important. Provided you keep your toothbrush clean, and replace it every 3-4 months, while brushing and flossing daily, and visiting your dentist regularly, your teeth will remain healthy. Water flossers are significantly more efficient than electric toothbrushes when it comes to reducing gingivitis and gingival bleeding. In case you opt for a water flosser, it’d be wiser to use it in conjunction with a manual or an electric toothbrush. In fact, dentists don’t consider water flossers as a substitute to flossing and brushing. Rather, they should be an additional step in your mouth cleaning process.